See: GSF documentation for complete class details. and the GSF includes various utility protocol libraries, e.g., PQDIF, COMTRADE, IEEE C37.118, IEEE 1344, IEC 61850-90-5, UTK F-NET, SEL Fast Message and MMS. The Grid Solutions Framework was created in 2012 as a combination of GPA's .NET 3.5/4.0 Time Series Framework and TVA's Code Library projects on CodePlex. Since its creation, a significant number of new code components have been added and the libraries have been re-factored to make the integrated GSF framework more secure and significantly better performing. Or refer to the full library listing. The Time-Series Library (TSL) included within the Grid Solutions Framework is a powerful collection of methods to process real-time streaming data. Implemented with an adapter-based extensibility model for pluggable inputs, actions and outputs, the TSL allows fully customizable real-time data processing. Systems using the TSL inherit the ability to manage, process and respond to fast-moving time-series data at low latency. The TSL can also be used to manage time-series data that includes an accurate time-stamp at the moment of measurement, such as values acquired from source devices with GPS time-sources. Time-series values with accurate time-stamps can be routed to user-developed adapters that inherit the ability to time-align, i.e., concentrate, values with other time-series values that were measured at the same time. Once time-series values are aligned by time, an action - or calculation - can be performed over a slice of all the data received for the same time-stamp. Because of its modular design, systems implemented using the TSL become general purpose distributed stream processing engines. New fully self-contained, derived time-series based applications can be easily developed using the TSL that include all the needed user interface components for configuration management, database schemas for various databases systems (e.g., SQL Server, MySQL, Oracle and SQLite), and historical time-series data archiving. 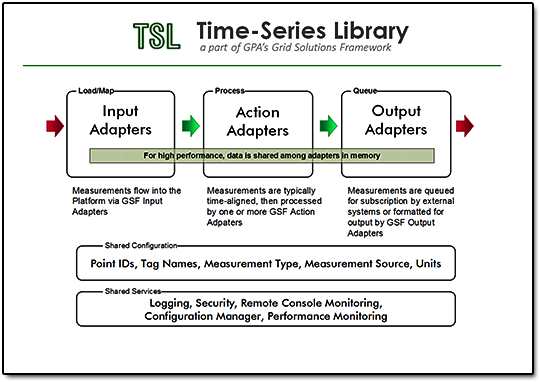 See the GSF Time-Series Library components overview](/docs/products/gsf/tsl-components-2015.pdf) for more information. The Gateway Exchange Protocol (GEP) is a measurement-based publish/subscribe transport protocol used for efficiently exchanging time-series data. Through use of a command channel it can also automatically synchronize meta-data among applications. The protocol supports sending real-time and historical data at full or down-sampled resolutions. When sending historical data, the communications speed can be controlled dynamically to provide data as quickly as possible, e.g., a data download, or slowed for visualization streaming. The wire protocol employed by GEP implements a publish/subscribe data exchange model using a simple command driven service with tightly compressed, fast binary serialization of time-series values. The protocol does not require a predefined or fixed configuration – that is, the time-series values arriving in one data packet can be different than those arriving in another. Each packet data consists of a collection of time-series values; each time-series value is a structure containing an ID, a time-stamp, a value and associated flags. The GEP Subscription Tester is a multi-platform graphical application that can be used to verify connectivity to applications implementing a GEP data publisher. When available in early 2019, STTP will support transferring both real-time and historical time-series data at full or down-sampled resolutions. Protocol benefits are realized at scale when multiplexing a large volume of time-series data points with low latency requirements. The wire protocol defined by STTP implements a publish/subscribe data exchange model by using simple commands with a compressed binary serialization of data points. The protocol does not require a predefined or fixed configuration - that is, the data points values arriving in one data packet can be different than those arriving in another. Each packet of measurement data consists of a collection of data points where each point is defined by a compact structure containing an ID, a timestamp (or sequence), a value and any associated state, (e.g., quality flags). Vendors participating in this DOE project include GPA, Electric Power Group, Washington State University, and Schweitzer Engineering Laboratories. Participating utilities include Bonneville Power Administration, Dominion Energy, Tennessee Valley Authority, Oklahoma Gas & Electric, Southwest Power Pool, and San Diego Gas & Electric. The SNAPdb Engine is a high-performance key/value pair archiving system. The SNAPdb is the archiving engine for the openHistorian 2.0. This technology was developed as a core data archival and retrieval system designed to significantly improve the ability to archive extremely large volumes of real-time streaming data and directly serve these large data volumes to consuming applications and systems. 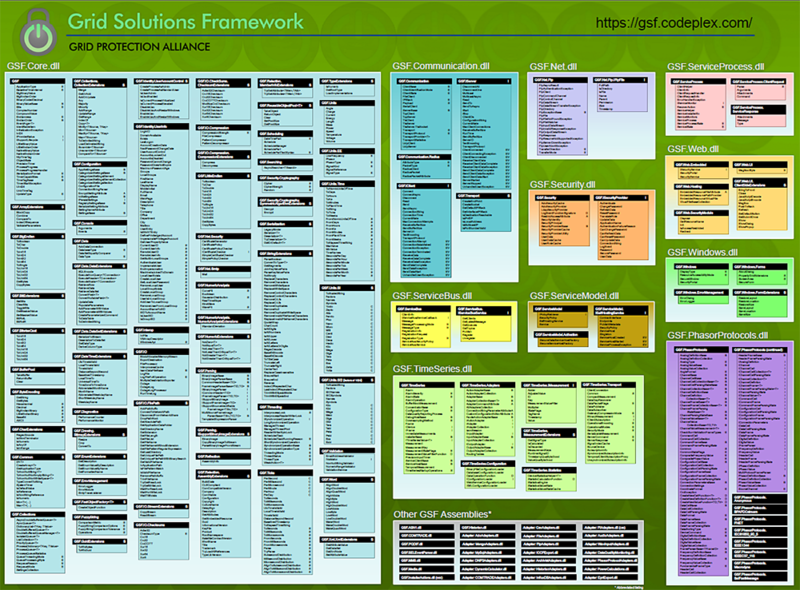 The SNAPdb code is contained within the Grid Solutions Framework. The "SNAP" of the SNAPdb engine is an acronym for: Serialized, NoSQL, ACID Compliant and Performant. You can think of the SNAPdb engine like a high-speed, file-backed dictionary or hash-table. Developed as part of the ARMORE project, Broccoli Sharp is a C#-based API wrapper for the Bro intrusion detection system API called Broccoli, the "Bro client communications library". This interface allows Bro users to leverage existing .NET technologies such as the the Grid Solution Framework when using Bro. The library consists of a set of managed C# based .NET classes and structures that wrap Broccoli functionality. The Broccoli Sharp library fully implements the Broccoli API and will allow Bro applications, e.g., ARMORE, to create client sensors, receive Bro IDs, send and receive Bro events, as well as send and receive event requests to and from peering Bros. Additionally, just as in the native C Broccoli API, this .NET library can be used to create and receive values of pure types like integers, counters, timestamps, IP addresses, port numbers, booleans, and strings. As Bro is normally only deployed in Linux environments, the BroccoliSharp library was developed to run in conjunction with Mono, an open source implementation of the .NET framework that works on various platforms, including Linux. BroccoliSharp, along with complete documentation, is available as an open source project on GitHub. In order to be fully compatible with other Bro projects, this library is published under terms of the BSD license. GPA utilizes leading-edge technologies in the development of new products. The specific technology selected varies based on the target platform and suitability to the deliverable. Unless there is a clear advantage from a competing technology, GPA uses .NET when possible because of its rich set of development tools and wide deployment options; however, our expertise includes many other platforms and technologies. A strength of GPA is in its ability to rapidly develop new, practical technologies for immediate application in industry environments using development technologies that allow the widest possible deployments. When dealing with both traditional data and Big Data, GPA uses various technologies and brings years of data driven experience to bear for new development. ZeroMQ - A light-weight messaging technology with adapters available in many languages that scales well and which enables message queuing, routing and filtering. ZeroMQ can be deployed with or without a dedicated message broker. Copyright © 2018 Grid Protection Alliance | All Rights Reserved.